Bacon. Did someone say bacon? Yep. And peanut butter. 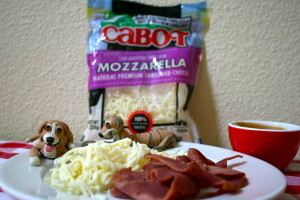 And Cabot Shredded Mozzarella Cheese. Need we say more? Ok, here is how you do it. Step One: Take your bread. Put peanut butter on the slices. Put cheese on the slices. Put bacon on the slices. Press it together. We said this was easy! Step Two: Spray a non-stick pan with olive oil and heat to medium temperature. 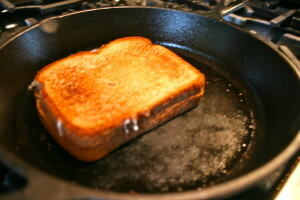 Cook on both sides 3 to 5 minutes or until golden brown. Please don’t eat it before you give to your dog! Step Three: Let cool completely before serving. Did we mention not to eat it? This is for your dog, humans! Oh, and this recipe is positively Digby approved!